I am sorry that i have not been able to post for a while due to computer problems and a heavy work load. Like the Ukrainians and the other Baltic States, the Lithuanians attempted to establish an independent state during the final part of WWI. Like Latvia and Estonia, and unlike Ukraine, the Lithuanians succeeded. They were annexed by the Soviet Union in 1940, and only regained their independence in 1991. For further detail see this article. 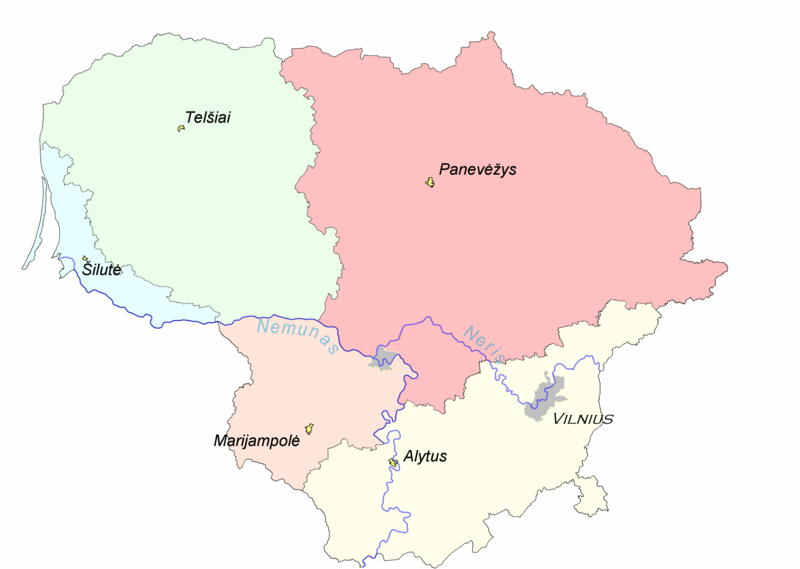 Culturally, Lithuania is divided into between 4 and 7 regions, depending on which source you consult.The simplest categorization is to divide the country with more or less straight lines east-west and north-south which intersect a little to the northwest of the city of Kaunas. 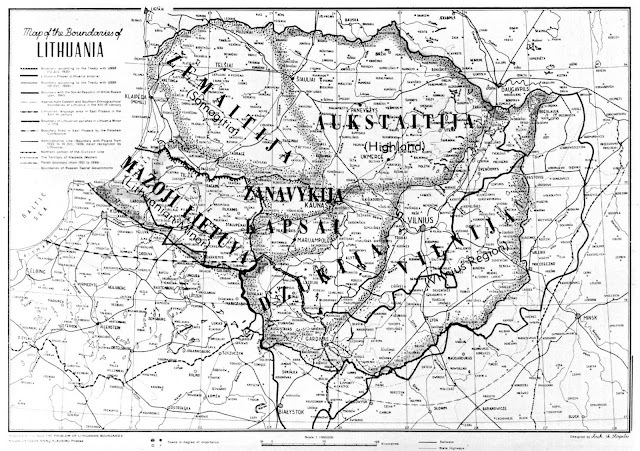 The northwest quadrant is called Samogitia, Žemaitija, or Lower Lithuania, the northeast is called Aukštaitija or Upper Lithuania, the southeast is called Dzūkija or Dainava, the land of song, and the southwest quadrant is called Suvalkija or Sūduva. Here is a map showing this. Most sources would include a fifth region, Lithuania Minor, Mažoji Lietuva, or Klaipeda, after its largest city. The reason that some authorities do not include it is because most of the territory of Lithuania Minor is outside the present day borders of the state of Lithuania except for a narrow strip along the coast as you can see above. Here is a map of the five regions. 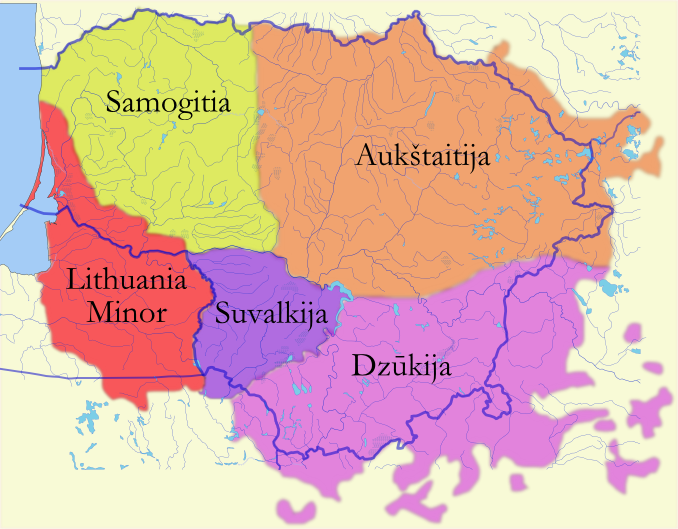 This map shows the historic range of the Lithuanian people. Much of the territory outside the current borders was of mixed population, especially in the south. ﻿In the 20th cent. many of these populations have been moved. Some sources will split the region of Suvalkija into two regions which vary somewhat in costume. dialect and culture. They also point out that the city of Suvalkai after which the region is named is now in Poland. 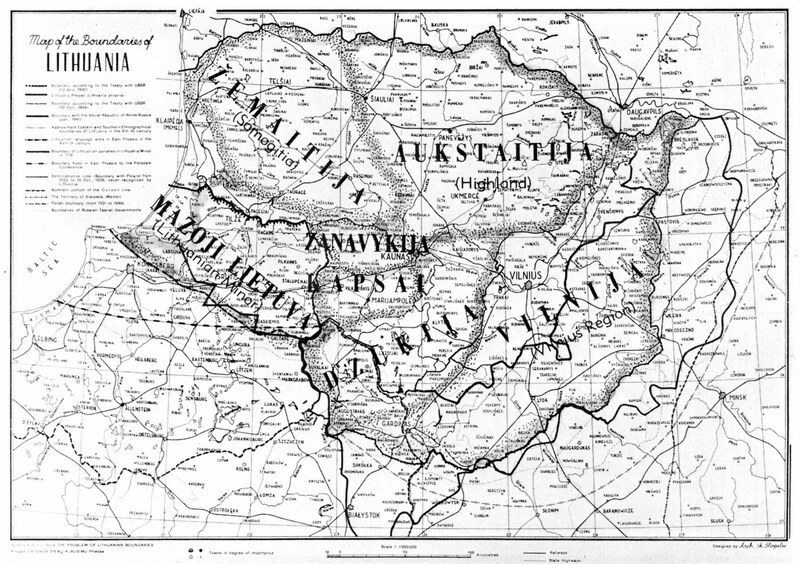 The northern half is called Zanavykia, and the southern half Kapsai. Finally, some authorities in the mid 20th cent. considered the area around Vilnius to constitute a distinct region as pertaining to costume. Thus we are now up to 7 regions. There are some distinctive features of the costumes of the various regions, but they tend to be in the details of the color schemes, cut of bodice, weaving techniques, type of ornamentation and suchlike. Lithuanian costume forms a quite distinct whole, and it is quite possible to construct a costume made of pieces which lack the distinctive features and is difficult or impossible to assign to any region. There are two tendencies currently seen in the presentation of Lithuanian Folk Costume. The first is a continuation of the tradition began around the beginning of the 20th cent. This was the time of the development of National Identity in many countries. In Lithuania, as in other places, city people began to recognize National dress as a symbol of their nation, and as an expression of Native Art. They began to wear National dress as a symbol of their identity on special occasions. 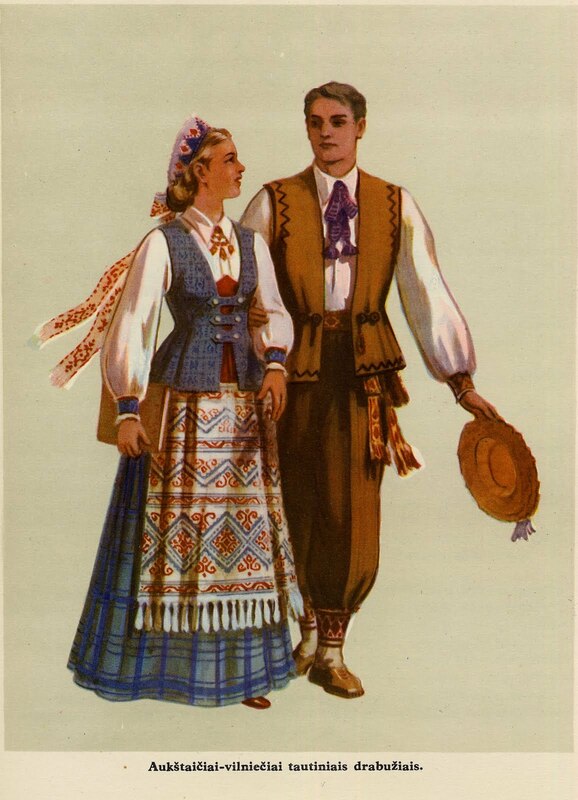 Scholars began to collect rural clothing, and analyzed them for those characteristics which were most unique to Lithuania, and for the elements which were most decorative and impressive. Items of clothing which resembled those of the Polish or Belorussians were downplayed. The most impressive techniques were copied and developed. Urban women were encouraged to learn to weave on hand looms. This became seen as a patriotic mode of expression. 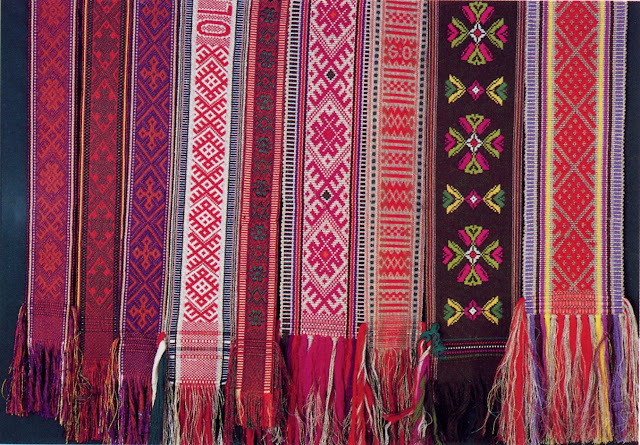 Much artistic effort and creativity went into the development of weaving techniques. The result is the spectacularly beautiful type of costume seen worn by Lithuanians on cultural and political occasions, and at the mass dance gatherings which continue to this day. Here is a typical example. 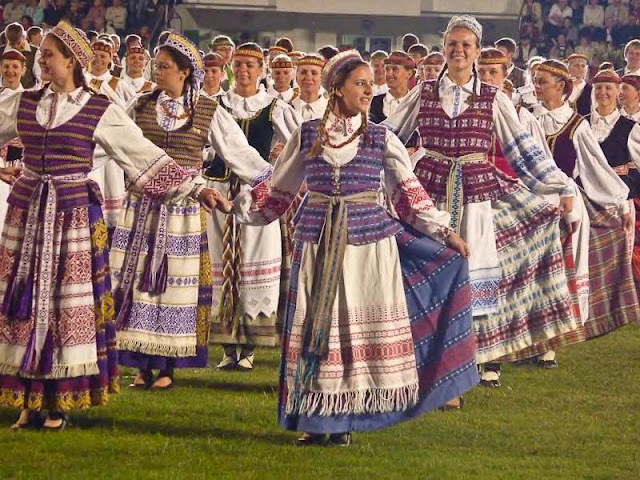 Here is a link to a local Lithuanian dance group website. You can see the variety of patterns and colors within the basic costume structure. 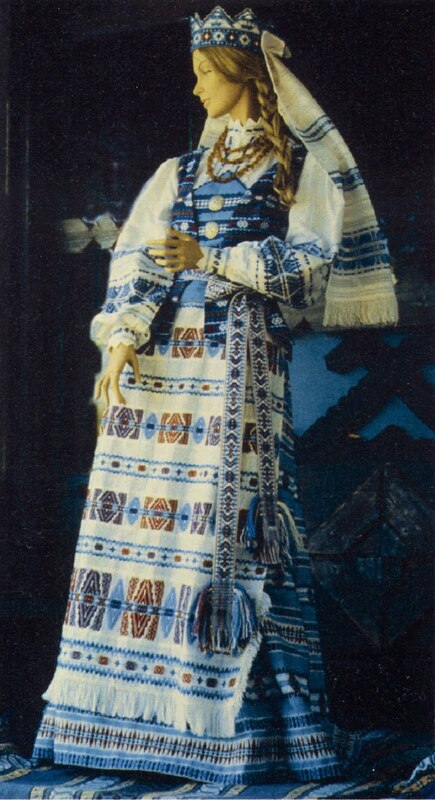 This might fairly be considered a National Costume rather than a folk costume. There was at some level an attempt to preserve the differences in the regional costumes while developing each of them. I have, however, seen many amateur groups in which pieces from various regions are combined in one ensemble. I myself once purchased a skirt and apron which, upon arrival, were obviously from different regions. Many times however, the color schemes are different enough to not allow regions to be mixed. This type of costume is depicted in the illustrations of Vitautas Palaimas, which were popular in the 1950's. These types of costumes often take center stage at Museum Exhibitions. Here is a link to the Lithuanian Museum of Art in Lemont, Illinois in the Chicago Area, showing exceptionally artistic variants of the costumes of different regions. 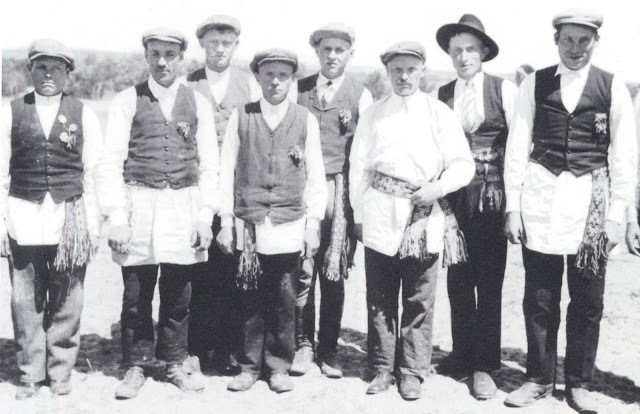 The second current tendency in Lithuanian Costumes, which might give rise to some confusion to those who peruse the existing material, started around 1990. [I am informed by one of my readers that it in fact dates back to the period between the two World Wars, and was fueled in part by pro-Soviet and anti-Soviet camps.] It is typified by a couple of excellent books, Both entitled 'Lithuanian National Costume' one by Terese Jurkuviene, published in 2004, and the other by Vida Kulikauskiene et al in 1994. The watercolor illustrations of the second are typical of this new school. [If someone who reads Lithuanian can tell us the artist's name, i would be very grateful, as i cannot make out which of the names cited is the artist]. This movement has gone back to the 19th century and emphasizes reconstruction of the clothing actually worn at that time. It has abandoned the artistic elaboration of the 20th cent, in part, i believe, because hand work in general is no longer as accepted a part of our daily lives in the same way that it was a century ago. This school may be considered to be more concerned with 'Folk Costume' as opposed to 'National Costume'. There is more emphasis on simpler clothing, on bought materials, such as brocades and damasks, rather than on the elaborate artistic weavings emphasized in the 20th cent. The 20th cent. interpretations emphasized nagines [moccasins], or clogs, whereas this new school emphasizes shoes and boots. Here is an excellent website which typifies this school of thought. It includes several illustrations by the same artist as in the book cited just above. It would seem to me that both can be considered equally 'authentic', as both are expressions of the art of Lithuanian costume. but the larger emphasis by far is on woven ornament. 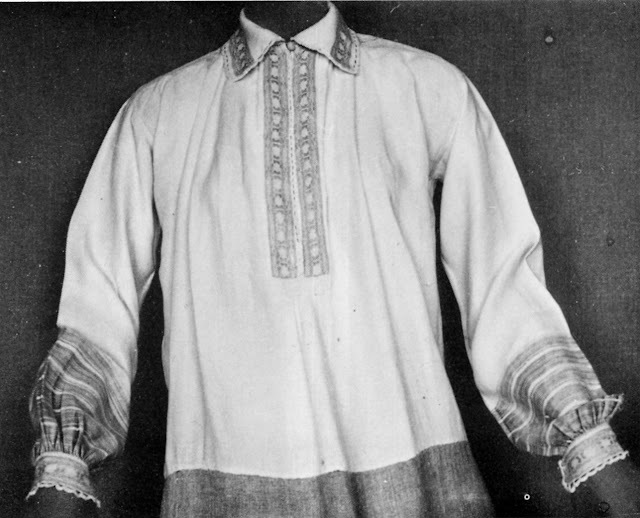 The chemise has relatively narrow shoulder pieces, as in most Latvian costume, Typically the collar, cuffs, sometimes the front opening and shoulder pieces, and especially the LOWER sleeves were decorated with designs woven into the linen. The concentration of ornament on the lower sleeves is unusual and typically Lithuanian. The lower part, from the waist down were typically made of a coarser linen. As in many places, starting in the 1950's the upper part of the chemise was sometimes cut off so as to be able to wear it with modern clothing. Skirts were usually worn at ankle length, of wool or linen, generally 3.5 to 4 meters/yards around. 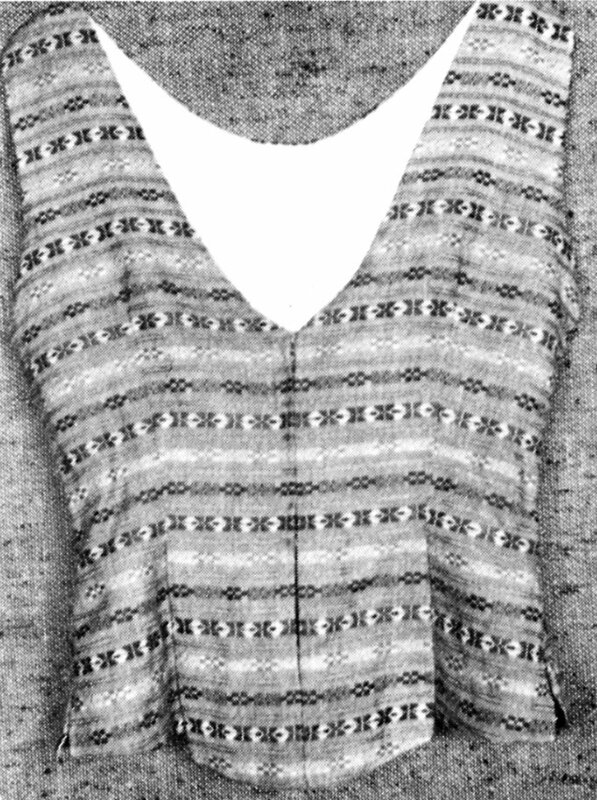 Plaids are more common in the East, and Stripes, [usually vertical] in the West, Horizontal bands of ornament are also known, and greatly emphasized in the 20th cent. elaborations. 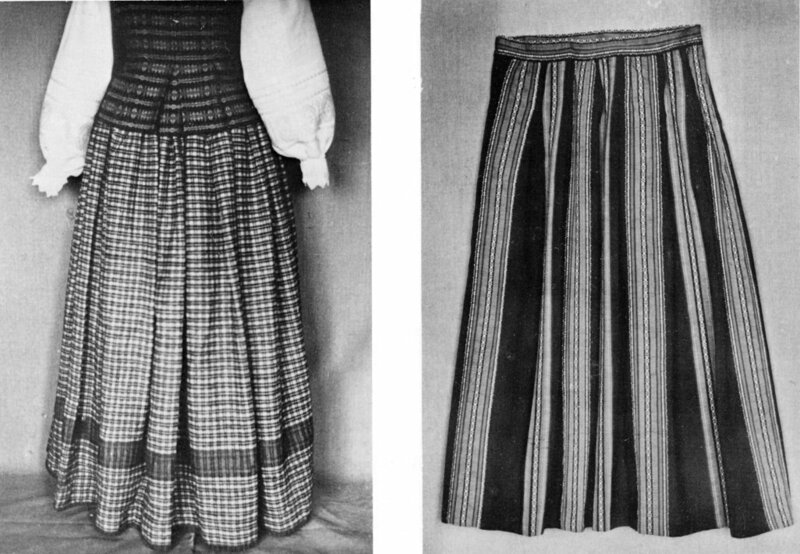 Unlike Latvia, in Lithuania the apron is considered to be an indispensable part of female costume. There is an extremely wide variety, short, long, wide, narrow, linen, wool, brocade, plaid, plain, striped, horizontal ornament, vertical ornament. There isn't space to go into this here, i will return to this subject. The costume could be worn without the bodice, but when dressing for a special occasion, it was considered necessary. The exact cut varied with the region, but generally was hip length, included a peplum or large lappets, had woven designs finer than those found in the apron or skirt, and fastened in front. Examine the various photos here in this posting. There is a wide variety of these, most commonly seen in dance groups is one of the variants of the crown-shaped open topped headdresses proper to unmarried girls. These generally have woven ornament and ribbons hanging down the back. There are various names depending on which exact type one is referring to. Married women traditionally used forms of headdress which covered the hair. The sash is considered the single most important piece of the national costume. It tends to be 3 to 4 inches wide, circles the waist twice and hangs down quite a bit. It is usually inkle woven, although other techniques are also used. There are many elaborate designs used. One of the most common types of folk art sold as souveniers or displayed in the home are the sashes, sometimes with a place name or phrase woven into the design. They always end in fringes, and usually have supplemental fringes inserted between the weft at both ends. Even when the men abandoned traditional wear for contemporary city clothing, the sash was the last piece of the costume retained. This has been just a general introduction, and is far from complete. I will be preparing posts on each of the seven regions, and on some of the individual costume pieces and ornamentation techniques. There are many exceptions to most of what i have stated here. I will end this post with a photo of an exceptional costume in the 20th cent style. This was given to Princess Diana by the Lithuanian community of Great Britain. It was designed and woven by Anastazija Tamošaitienė, sash woven by Aldona Veselkienė, and silver brooches crafted by Antanas Tamošaitis. I always enjoy your blog. Here in Canada, a country of immigrants, I often come across interesting, old European textile, you have helped me a lot. I am very pleased that I have discovered your blog. This is my area of interest too - especially the dress of eastern Europe. Maybe you would like to look at my own blog. I have not put anything new on it for a while, but now yours has inspired me to work on it again! Your blog has been helpful. I'm an author and I have a book out called Rock and a Hard Place, A Lithuanian Love Story. I'm going to a Lithuanian festival to sign and sell my books and I'm trying to create a costume to wear. Your pictures are very helpful. Thank you! Thank you for your big job - collecting and sharing the information about Lithuanian national costume. Let me say you, that some of the sources, you were using, especially books, written at Soviets era, were not very trustable, a lot of published information of that era was not right, it wasn't based by research and reconstruction of authentic 19 century folk cloths, but presented a stylized costumed, using imagination of textile design, but it was far away from real national costume. I have a complete costume, no sash, by Tamosaitiene that was made for me about 1965. I would like to sell it, it's about a size 6-8 US. and looks very much like the one made for Princess Di. Do you have any ideas.